Sitting on a 2-acre lot at the end of a cul-de-sac, Holiday Springs offers peaceful mountain living with not another cabin in sight! Instead, you’ll be setting your eyes on tree-studded views of the Smokies from your screened-in porch with a fireplace…or your other screened-in porch with a hot tub…or how about your covered picnic area with a charcoal and gas grill?! These are just the start of the impressive amenities Holiday Springs has to offer. 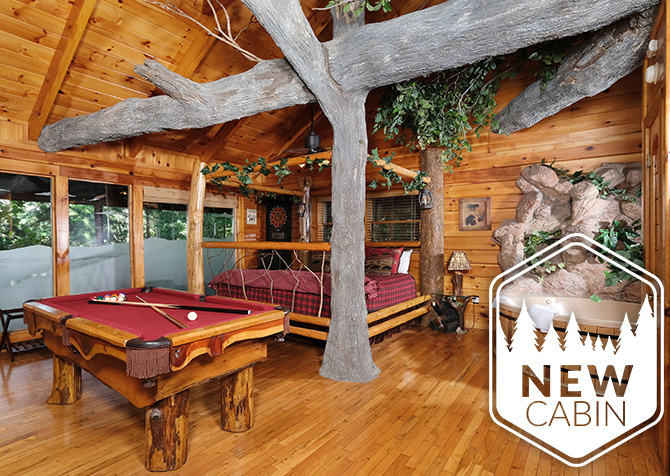 This 3,500-square-foot cabin also features a cozy theater room with a 60-inch HD flatscreen, a huge game room with everything from foosball to air hockey to arcade games, 7 flatscreen TVs and a custom-built pool house with an indoor heated chlorinated pool! Bring the family for an unforgettable stay in the Smokies or plan a getaway with a small group of friends. This beautiful log cabin with updated features and charming Smoky Mountain décor offers all the amenities you’re looking for—and plenty more you never thought you’d find! High vaulted ceilings, large windows, and an impressive fireplace structure with stones to complement the natural wood walls—these are just a few of the beautiful features you’ll find inside the Holiday Springs living room! This spacious, comfortable room offers plenty of options for seating, including a full-size sofa and twin matching chairs, along with a Christmas theme all year long. You’ll also find a comfy chair against the wall of windows and a small 4-piece table that’s perfect for cards or games in front of the fire. The fireplace runs on gas, so you can easily warm up on cool winter morning during your Gatlinburg stay. Other convenient features of the Holiday Springs living room include double ceiling fans, an end table with a reading lamp, a large coffee table, and a flatscreen TV. And because it’s Holiday Springs, the living room is decked out in Christmas cheer year-round. Stockings hang from the chimney, a wreath adorns the fireplace, and guests are even invited to add their own special ornament to the tree! With modern amenities and a plenty of space, the updated kitchen inside Holiday Springs is exactly what you’ll need for a group getaway to Gatlinburg. Use your mix of black-and-stainless-steel appliances for refrigerating leftovers from downtown restaurants, baking homemade apple pies, or serving up pancakes straight from the stove. And with the feel of Christmas year-round, this lovely space will certainly put you in the baking spirit. Besides all your major appliances, Holidays Springs offers convenient extras like a coffeemaker, double toaster, blender, wok, crockpot, electric tea kettle and electric can opener. Whether you’re planning dinner for the family or a homemade holiday feast, this Gatlinburg cabin provides the tools, appliances, and counter space you’ll need. It even has a highchair for those traveling with kids! With 14 guests, you might wonder where everyone will sit to enjoy those delicious, homemade meals you prepared in the kitchen. But at Holiday Springs, you won’t wonder long! This 3,500-square-foot cabin provides a beautiful, black-and-tan wooden table with place settings for 8. Adjacent to the dining table, you’ll find a 3-piece breakfast bar with additional seating, and both rooms are open to the living room, where you’ll find several comfy options should you choose to spread out. For other dining options, Holiday Springs provides an outdoor, covered picnic area next to a gas and charcoal grill, a wooden dining table in the screened-in porch with the outdoor gas fireplace, and several other tables scattered throughout the property. A playroom for the kids, a lounge for the guys, a hangout for couples and friends—the game room inside Holiday Springs is definitely one of this cabin’s most versatile and exciting spaces! At Holiday Springs, you’ll not only have access to multiple game tables—including pool, air hockey, and foosball—but also a bistro-style table that’s perfect for cards and board games. Be sure to pack your favorite board games, yard games, and car games for your stay at Holiday Springs! For even more indoor fun, this cabin’s game room provides a comfy couch in front of a flatscreen TV and 2 full-size arcade games. Finally, with a stoneset gas fireplace, large windows overlooking the trees, and a second comfy couch, this space provides a cozy place for an afternoon nap or catching up on that novel you keep meaning to read. Life is easy—and full of fun—in the Holiday Springs game room! Before you leave the game room, be sure to cross through the stoneset doorframe of the “Breeze Theatre”—your very own private theater inside Holiday Springs! This room comes with 3 leather recliners and a large leather couch. Kick back with a bowl of popcorn to watch your favorite DVD or Blu-ray on the 60-inch HD flatscreen mounted on the wall. You’ll feel right at home in this cozy, carpeted space. And don’t worry if you forget to pack some movies—Holiday Springs provides a movie library along with surround sound for a true movie theater experience! 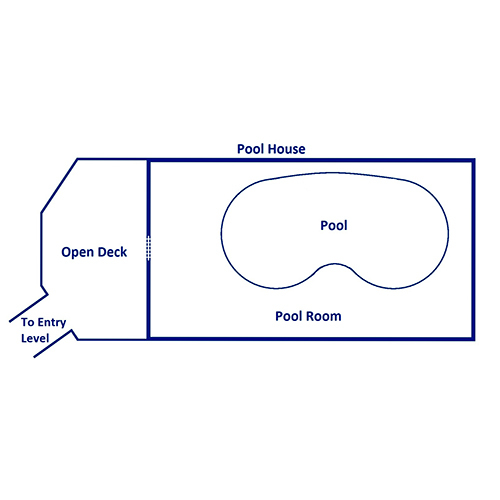 As you head down the steps away from the main portion of the cabin, one of the impressive outdoor features you’ll find is a custom-built pool house with a small deck for sun bathing and a completely enclosed, private, heated chlorinated pool! Enjoy relaxing afternoons wading in your indoor pool with stone accents. Or spend the day splashing the kids when the weather is cold and damp and you’re looking for something fun to do. 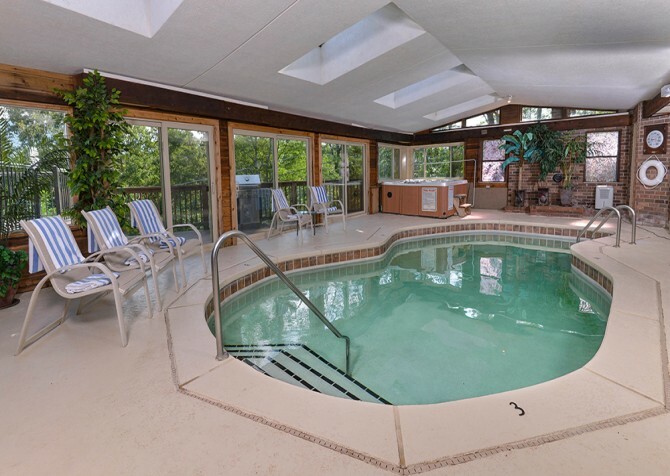 With overhead lights, you can even go for a midnight swim during your stay at Holiday Springs! But during the day, you’ll love your views of the Smoky Mountains provided by tons of large windows throughout this pool house. Holidays Springs is a cabin built for multiple families, small groups of friends, and other 14-person retreats. For your convenience, this large cabin divides up its sleeping spaces between 3 main bedrooms, each offering a king-size bed, its own bathroom, a flatscreen TV, and charming Smoky Mountain décor and furnishings. 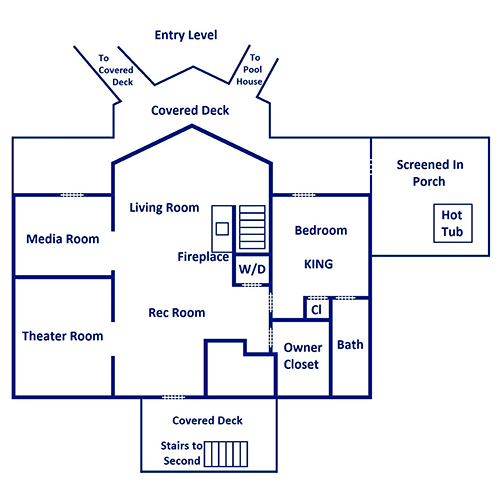 The extra sleeping accommodations at Holiday Springs come from 4 sleeper sofas found throughout the cabin—1 in the living room, 1 in the game room, 1 in the alcove adjacent to the game room, and 1 in the theater room. So invite a few extra friends and enjoy your peaceful retreat at Holiday Springs! Featuring a leaf-covered quilt, rich autumnal colors, and pumpkin details, this cozy bedroom celebrates Thanksgiving and the beauty of fall all year long. Rich red bedding, roses, and romantic art prints around the room…find romance and relaxation in all the lovely details in this special room. This bright and inviting room boasts lots of patriotic touches, from the star-spangled bedding and American flag above the bed to the white-and-blue lamps and patriotic signs over the nightstand. The outdoor spaces are really where Holiday Springs shines above the rest. Not only does this beautiful, private cabin sit on a 2-acre lot with absolutely no other cabins in sight, but it also offers plenty of ways to soak up the quiet, peaceful atmosphere of the Smokies along with gorgeous mountain views. 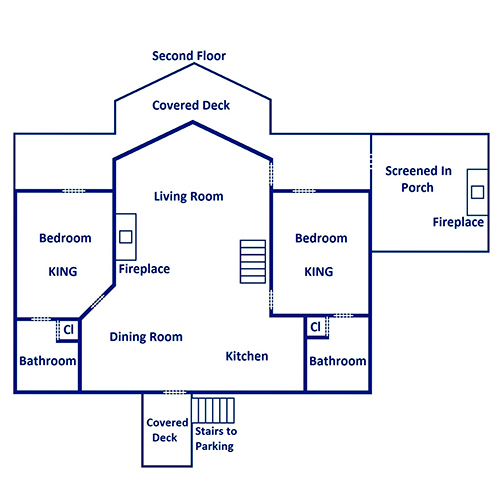 Holiday Springs provides access to not 1, but 2 screened-in porches! The first comes complete with a gas fireplace, an outdoor dining table, a ceiling fan, and another table that’s perfect for cards or games. And the second contains this cabin’s private outdoor hot tub! Enjoy a relaxing soak with only the sights and sounds of the Smokies to distract you. Other outdoor amenities offered by Holiday Springs include rocking chairs, 2-piece dining sets, a swinging wooden bench in the lawn, and a boardwalk that leads to a covered picnic area with gas and charcoal grills. Your group is sure to have plenty of options for outdoor fun at Holiday Springs! It even features a built-in tetherball game and a professional-size basketball hoop and basketballs for some outdoor recreation and fun. Even though we’ve already listed tons of amenities at Holiday Springs, the list still isn’t complete. Inside this cabin, besides all the other convenient amenities, enjoy access to a washer and dryer! Holiday Springs also offers a flat, paved driveway with room for a trailer or 8-plus vehicles, and at the top of the driveway, don’t miss your outdoor basketball goal. There are so many ways to have fun with friends and family at Holiday Springs! Rated by TripAdvisor as the #1 aquarium in America and the #5 aquarium in the world, this popular Gatlinburg attraction features hands-on exhibits, a 4-story play structure, and tons of fish! Want some variety? Try Fort Fun, where you’ll find mini golf, laser tag, bumper cars, escape games, gem mining, a video arcade, and more! Any time of year, Ober Gatlinburg offers an Aerial Tramway, ice skating, a wildlife encounter, and a ski mountain coaster. And in the winter, try skiing and snow tubing on the slopes. *Denotes a Cabins for YOU partner. Ask our reservation specialists for discounts available to our guests at these and other area attractions. "We got the Holiday Springs cabin. It was beautiful. We had a wonderful vacation. The staff were always polite and helpful."